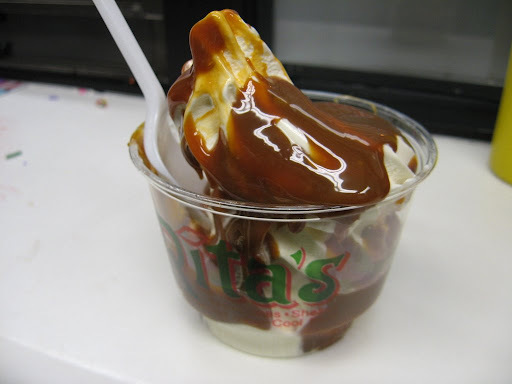 Back in the day when I was a frosh on the Swarthmore Cross Country team, my captains introduced me to a fantastic tradition called a Rita’s Run. These runs typically occurred twice a year; once during pre-season and again on the first day of spring. The run began at the college, went through Wallingford, and ended at the Rita’s located in Media. 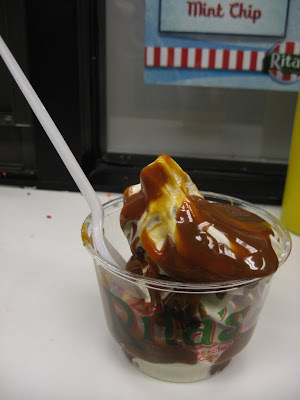 Upon arriving at Rita’s, we removed our sweaty money from our shoes, and ordered the frozen delight that moved us most. I usually ordered either a water ice or a Gelati. Our run back to school was always a little painful as the treats sloshed around in our tummies, but trust me, it was totally worth it. These days the closest Rita’s is a short walk from my apartment, which makes for a lovelier stroll than run. 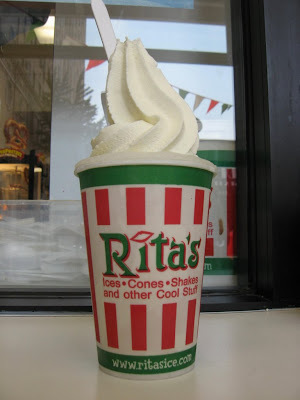 During my final days in the city, I hit up Rita’s as often as possible because sadly, water ice has not yet spread from sea to shining sea. 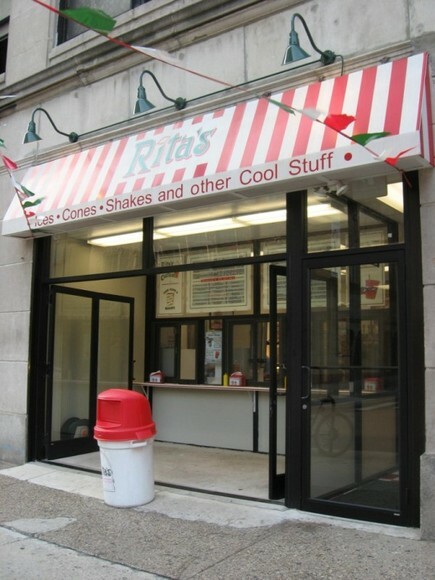 While Rita’s signature water ice is refreshing, my all-time favorite offering is their Gelati. 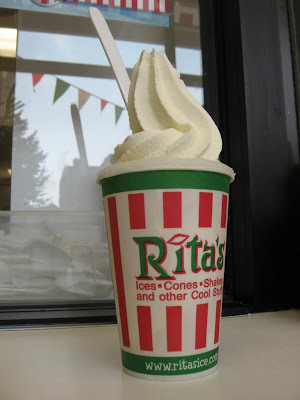 A Gelati is composed of layers of old-fashioned frozen custard and water ice and served in a cup. The Astronomer and I have tried a variety of custard and water ice combinations throughout the years, but our most beloved mishmash is vanilla custard with lemon water ice. The creamy vanilla custard coupled with the tart lemon water ice makes for a wonderful summer dessert or afternoon snack. I love the bits of lemon zest within the water ice. 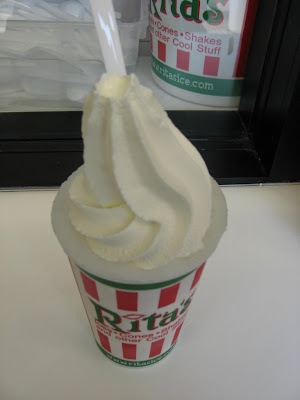 On a recent visit to Rita’s, I was in the mood for something other than Gelati and ordered a Toppers. A Toppers is chocolate or vanilla custard doused with either hot fudge or caramel. I ordered a vanilla custard with caramel topping. The caramel was lip smacking-ly delightful and oh so gooey. The topper definitely satisfied my sweet tooth, but was not cool like a Gelati is.